"Schwarzesmarken," the German word for "Black Marks." 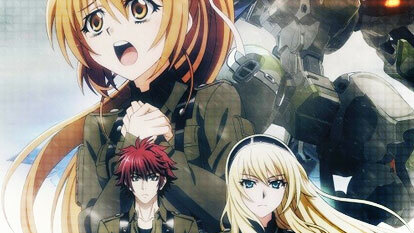 Set in the 1980s in an alternate timeline version of East Germany, Schwarzesmarken follows the East German Army's 666th TSF Squadron, also known as the "Black Marks." This special unit specializes in unconventional tactics using advanced technology. Their enemy? Beings of extraterrestrial origin, or the BETA, a fearsome and sometimes unpredictable enemy that seem dead set on destroying the human forces and taking the planet Earth for themselves and ripping it clean of its natural resources. Because the BETA come in all shapes and sizes, carrying any number of advanced alien technologies, the Black Marks must use the latest and most deadly weapons humanity can devise to drive them back. Irisdina Bernhard is the commanding officer of the Black Marks. As a war hero, she has earned the respect of her country. However, her cold exterior and personality make her extremely hard to work under, especially for one of the most talented members of the squadron, Theodor Eberbach. Only time will tell if the many battles fought together will bring peace to the earth, and between the many combating personalities in the 666th TSF Squadron.